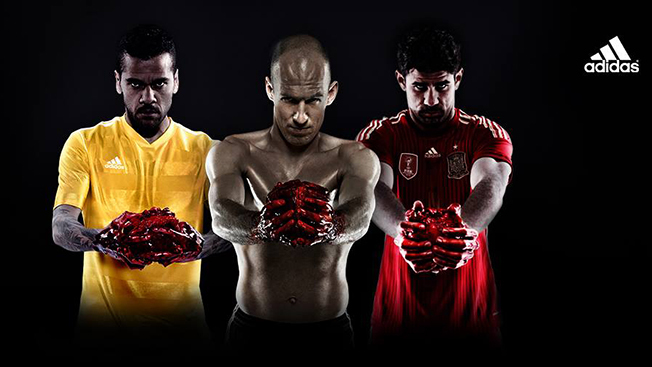 Animal rights activists are upset about, well, everything, but they're especially mad about an Adidas World Cup campaign in which soccer players are holding bloody cow hearts. The tagline for the ads featuring players from various nations is reportedly, "During the World Cup, I will give my heart to the cause." After the images were leaked on German forward Lukas Podolski's Instagram account, they were quickly criticized by Four Paws, an animal rights group from his own country. "He says he'd give his heart but it wasn't his heart was it?" a group spokesperson said in a statement to the media. "It was the heart of an innocent animal." Podolski has defended the creative, saying, "I don't find [the ad] disgusting," adding that "it just shows my promise to give my heart in our bid to win the World Cup." Thanks for that keen observation, Lukas. The brand's social media channels have also been flooded with comments from disturbed fans. "Seems like Adidas' campaign managers did not realize people actually do like animals and don't want their hearts being cut out, dripping with blood," noted one Facebook commenter. What I don't get is why they had to use real cow hearts in a photograph-based ad campaign when fake anything hearts would have worked just as well. Unless they were trying to rile up the animal rights crowd for publicity purposes, it just seems like wasted energy. If a giant glob of Gummi Bear is good enough for Daenerys Targaryen, it should be good enough for the World Cup.